Financial support is what allows us to bring the program for free into classrooms and across the country. Make a difference in science education and donate today. 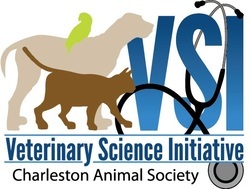 VSI: Veterinary Science Initiative was started with an idea for sharing veterinary science that spread with the determination of the education staff at Charleston Animal Society. Initial funding was provided by the American Honda Foundation, which enabled the program development and execution for the first time in the community. Without this seed, we would not have grown the nationally recognized program that is VSI. It provided the stability and support we needed. In 2013, we were able to get funding from the Elinor Patterson Baker Trust to spread VSI to other humane educators throughout the nation via a national conference at Charleston Animal Society. This funding helped train and supply humane educators with the tools they need to institute the program in their local area. many of our educational programs in the Charleston community. Now we need your help to continue to bring this program into the classroom and train humane educators across the nation. Every donation helps us meet our goals. Use the link to donate now and receive a gift in our appreciation for your support. If you are interested in a more substantial continuing donation please contact us directly. We would be happy to assist you in finding a sponsorship package that best fits your needs.